Pakistan Tehreek-e-Insaf (PTI) Chairman Imran Khan has said that corruption is the main problem of Pakistan, and PTI will make reforms and give a prosperous Pakistan to the nation. He was talking at the joining ceremony of Jehangir Saifullah Khan at his residence here Wednesday. Jehangir Khan is the chairman of Saif Group of Companies and son of Javed Saifullah Khan. He belongs to a veteran politician family of Khyber Pukhtunkhwa with three parliamentarians in his family, including his uncles Senator Saleem Saifullah Khan, MNA Humayun Saifullah Khan and MPA Anwar Saifullah Khan. 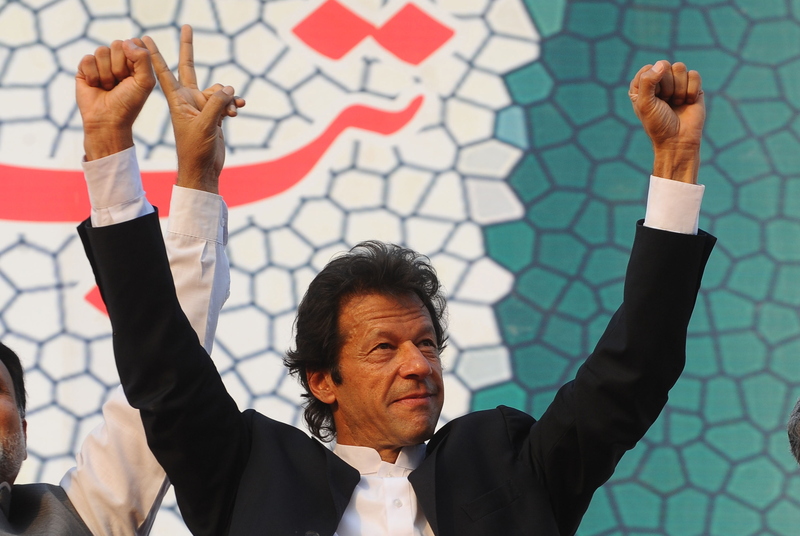 On the occasion, Imran Khan demanded of the rulers to resign from the government because they have failed to deliver. He said that PTI was the first party which presented the idea of an independent judiciary and refused to accept the ‘War on Terror’ as Pakistan`s war. He welcomed the new comer into the party. Jehangir Saifullah Khan, while talking at the ceremony, announced joining the PTI formally. He said that Pakistan is full of natural resources and still we are lacking electricity. If these resources are used properly we can overcome the power crisis. He informed Imran Khan about the problems of the southern districts of Khyber Pukhtunkhwa. He told the party chairman that the people of the southern Khyber Pukhtunkhwa are kept backward answering to which Imran Khan said that the PTI will resolve all the problems of Southern Khyber Pukhtunkhwa on emergency basis once it comes into power. Imran Khan kay Tsunami main aik aur Darya ja mila!!! Not sure from whre you are coming from?? InshAllah, PTI clean sweep the PK !!! imran you are greatest leader in the history. i always pray for your life and hate your enemies nawaz sharied and shahbaz sharief. Let us pray that all these new comers have a soft heart towards the poor and needy. Will they be able to impart the necessary ideas, plans and implementations to develop the country without begging for loans, aid and handouts? This is a moot point and bluster will not get PTI anywhere. Jehangir Saifullah is not a politician.Even though many politicians have joined Noon league who also claim to bring change but you have no objection over that.This shows your inner hatred for Imran Khan.Whatever he does, you will always dislike him as you have already made up your mind. I personally dont know this man but know his family members very well esp the 3 parliamentarians who are the most corrupt and hypocrites people. His family has done nothing in politics except making money and bringing backwardness to the southern KP esp to the Marwat region. mr.jhahangir s khan not leader even a very rod and cruel man.just watch him by near. Do you have any idea what you are talking about? What nonsense. This is the lucky family of Lucky Marwat ard indeed the rest are very unlucky people. Thats Pakistan! Yes that's what Pakistan is unfortunately. Great place for lucky few. But this is what IK promises to change. May Allah keep him alive and keep him true to his words and mission. He is educated son of a good and prominent family that has done substantial development work in South KP especially in water and education sectors. I hope the new generation uses their skills properly for uplift of nation. good luck and welcome to PTI. I agree to Mamoon Khan's comment. PTI will have a confirmed victory if Jehangir Saifullah Khan is given ticket for Lakki Marwat constituency. I am sure PTI will easily win seats in Lakki Marwat if ticket is given to Saifullah family. They are highly influential and respected family in KPK. Imran Khan (PTI) Conform the seat of Jhangir Saifullah Khan in Lakki Marwat. This is a great news for PTI and Pakistan that Jangir Saifullah joins PTI. He is educated young man of old respectful family of pakistan. he will make PTI strong. Hey sorry but I do not think Imran Khan is fit to be a politician!!! He is good as a cricketer not politician!!!!!!! And Jehangir Saifullah is the only Saifullah to join PTI… The main family members : salim Saifullah khan is in PML and Anwar Saifullah is in PPPP…. :-)) but I do hope that Pakistan gets a great president. InshaAllah! I agree with u Sarah. Good point. We all pray that pakistan get a good president. InshaAllah. Hahahahahahahahahahahaa… Lol… You guys are weird pakistanis!! Thank you fawad, I appreciate it!!! And John, I don't think you have anything to do with this.. So pls go and mind yournown business….!! @Jamshed Ali Khan: I think the Saifullah family is a great family that is trying to help Pakistan become a great country! i agree with you Hamza. It is great and best family of Pakistan and International. IK we r with u always Inshallah. This is great news. Saifullah family is a great family, who help the poor people of Pakistan. This is great news for PTI and Pakistan. Jehangir Saifullah is good and humble person, and is grand son of Khan Saifullah Khan also Khan Naimatullah Khan, two towering personalties of our area. I agree with everyone that the Saifullah family is a great family. MashaAllah. But, somehow i feel Imran Khan will lose the elections! Sorry!! Great news for PTI that someone like Jehangir Saifullah Khan has decided to join. They are royal family lakki and pakistan. A good news for Pakistan and PTI. Great news for Pakistan,and PTI. Great man join great party. Saifullah family most educated and enlightened family of Pakistan and the world. They are geniune people among elite who care for poor and downtrodden. Malik, they r chor dakoo who have looted our wealth and kept in 34 offshore accounts. this family needs to be put behind bars. Saifullah family great family of KPK. They are highly qualified, and have done lot for KPK in particular South KPK. Saifullah family can really make PTI strong and further Imran Khan's cause. Saifullah family is a great family of Pakistan that always think of the country first. Kulsum Saifullah Khan, Salim Saifullah etc are all our national heroes and champions. We hope Jehangir Saifullah Khan will follow in their footsteps. Miss Simin…why r they hiding money in offshore accounts??? they have 34 companies in offshore to hide black money…they r corrupt and deserve to be in jail. just from their faces they look corrupt to the core, money launderers and tax evaders. put them in jail. bring pakistan's money back. Saifullah family is a great family of Pakistan and Lakki Marwat. Salim Saifullah Khan did a lot of works for the area, so did Anwar Saifullah Khan provide jobs to people. Their mother Begum Kulsoom Saifullah Khan helped many needy and poor people, and was very active since independence movement against British. Jehangir, I am sure being their nephew is able and capable, and will not disappoint. Good for PTI.